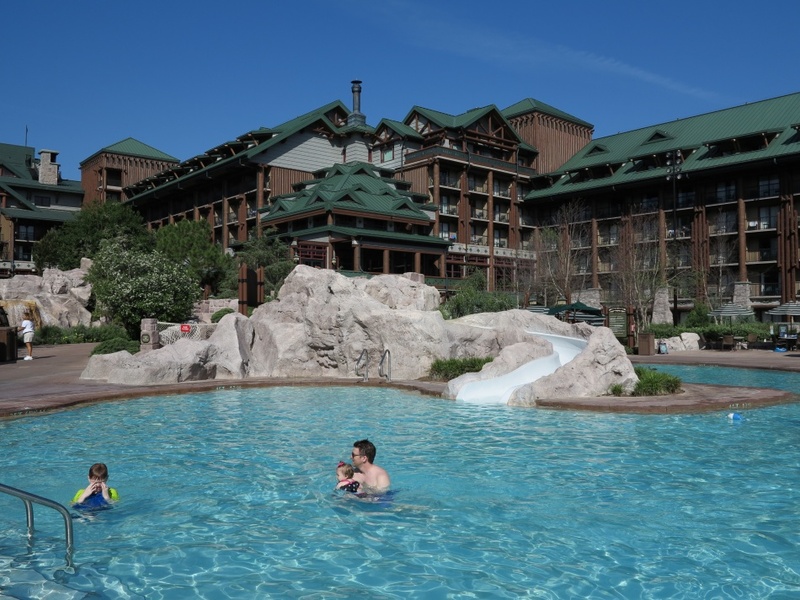 Guests have the option to enjoy two different pools when staying at Disney’s Wilderness Lodge and Villas Resort. 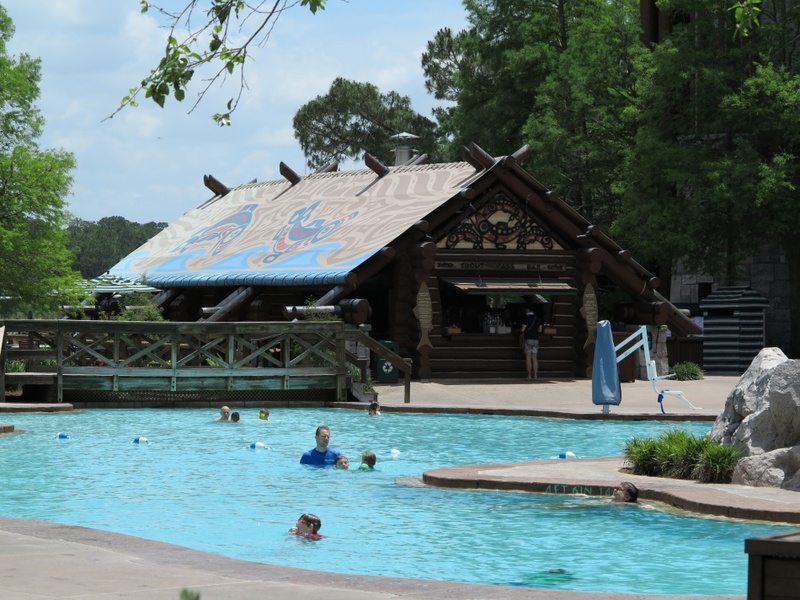 The feature pool, Silver Creek Springs (number 1 on the map), is located between the Lodge and Bay Lake. 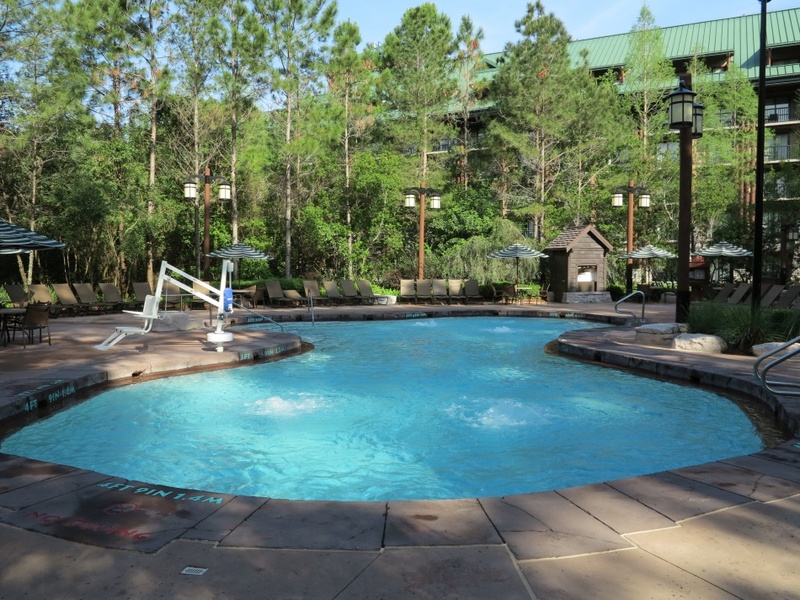 Near the Disney Vacation Club Villas you’ll find the smaller Hidden Springs pool (number 2 on the map). 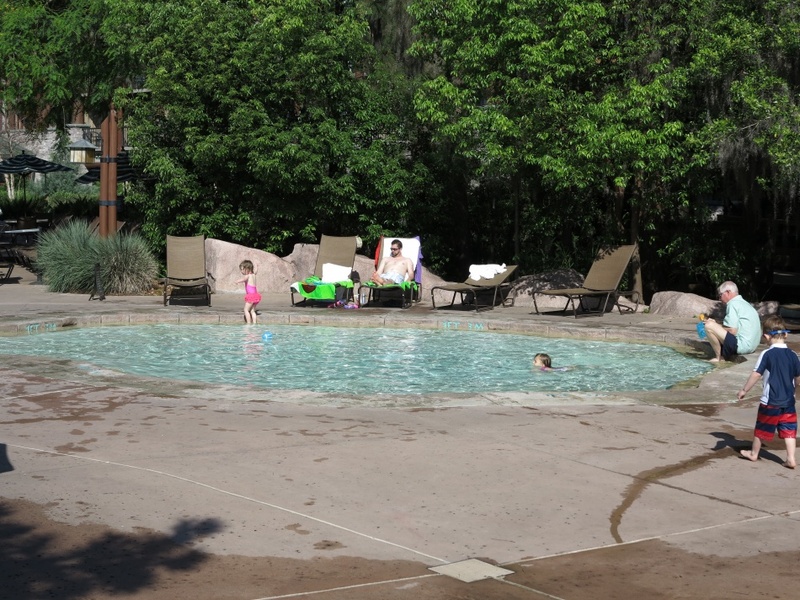 When describing the Silver Creek Springs pool, one really must start at the beginning – which, surprisingly, is inside the Lodge. 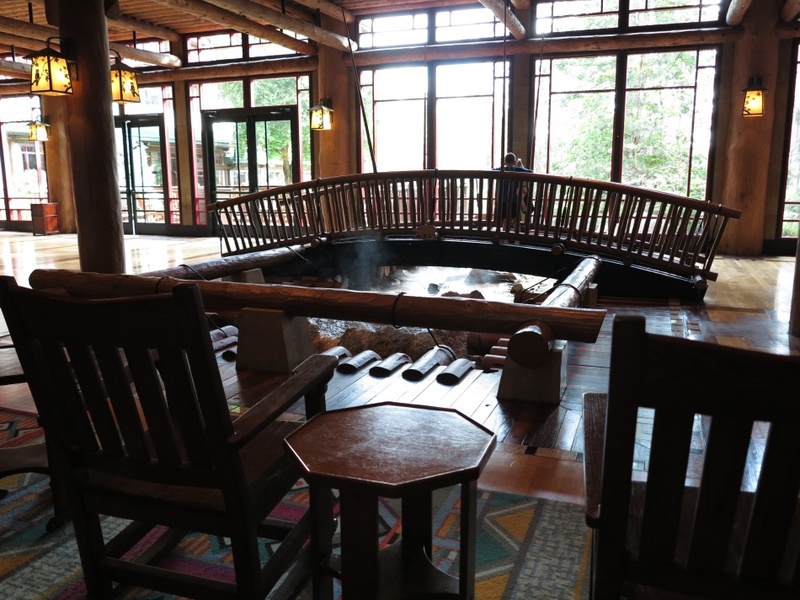 The Silver Creek Spring actually bubbles up from the ground below into the lobby of Disney’s Wilderness Lodge, where it then flows beneath the large windows to make its way outside, eventually to fill the swimming pool. It winds its way through a meandering stream bed lined with wildflowers, where it eventually tumbles over an impressive stand of rocks and boulders into a pool below. This small pool is not for swimming, but it is a lovely place to snap a photo of the Lodge with Silver Creek Falls in the foreground. 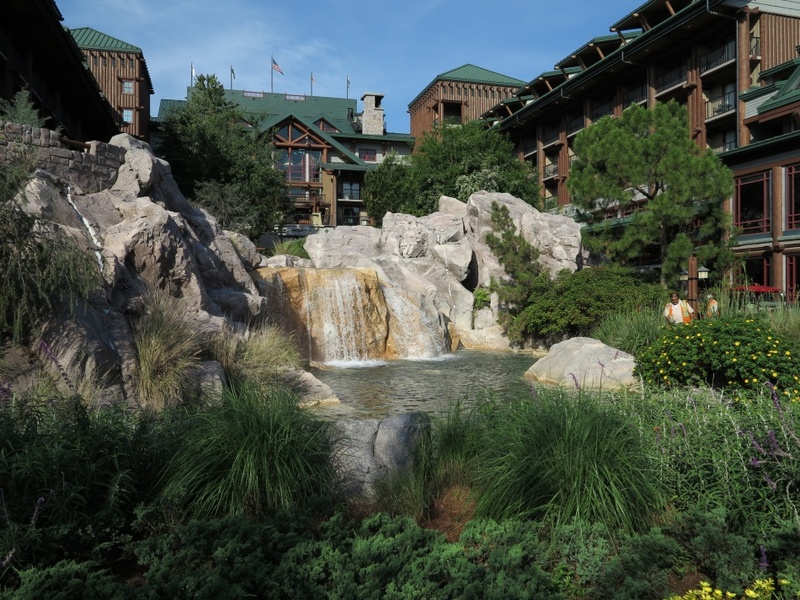 Next, the spring makes its way downstream, feeding into the large swimming pool below, eventually to make its way out into Bay Lake. 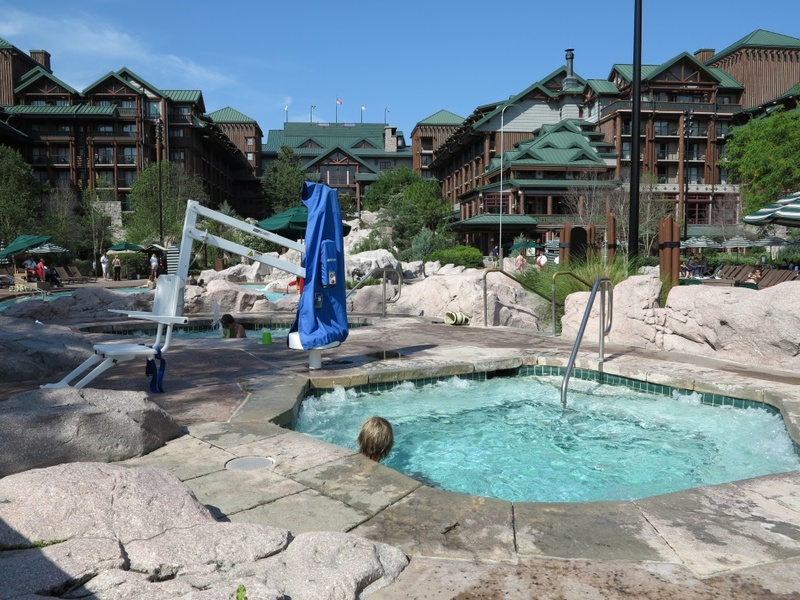 Of course, a little Disney magic keeps the chlorinated water of the swimming pool out of the stream and lake. 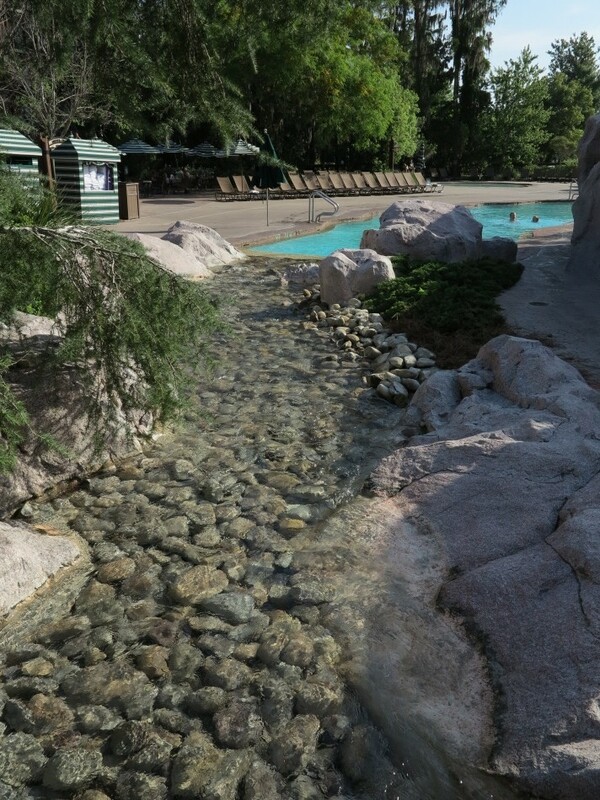 Compared to some Disney resorts, the slide at Silver Creek Springs may seem fairly tame. However, I didn’t notice anyone complaining. In fact, everyone seemed to be having a great time as they splashed down into the pool. At the far end of the pool is the Trout Pass Pool Bar where you can get assorted refreshing beverages, with and without alcohol. The building reminds me of Native American long houses that I’ve seen in the Pacific Northwest. 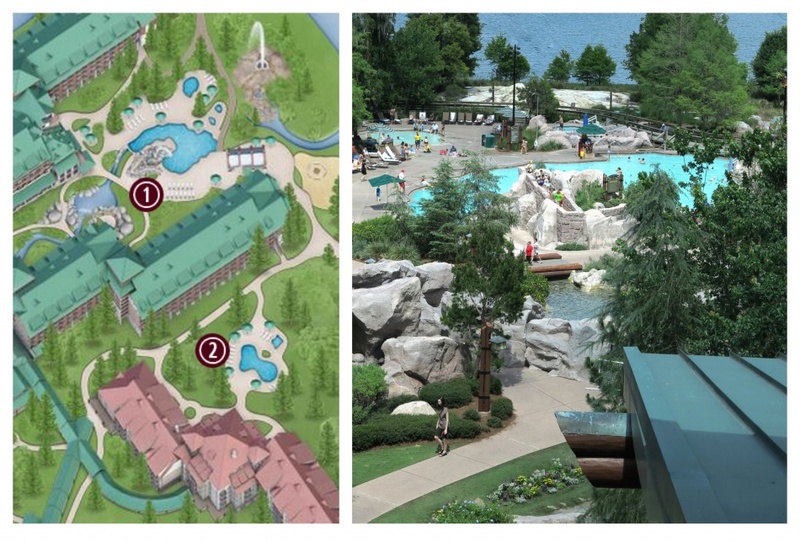 There are two spas, side by side, between the main pool and Fire Rock Geyser. Test them both out to see which is more to your liking – one is cooler than the other. Next to the spas is a good sized wading pool for the youngsters. 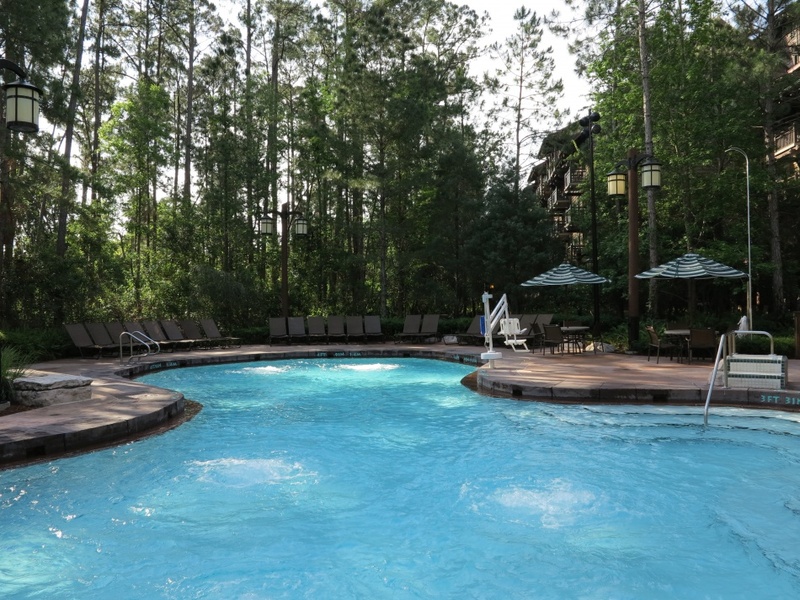 Nestled in the forest between the south wing of the Lodge and the Disney Vacation Club Villas is the Hidden Springs pool. 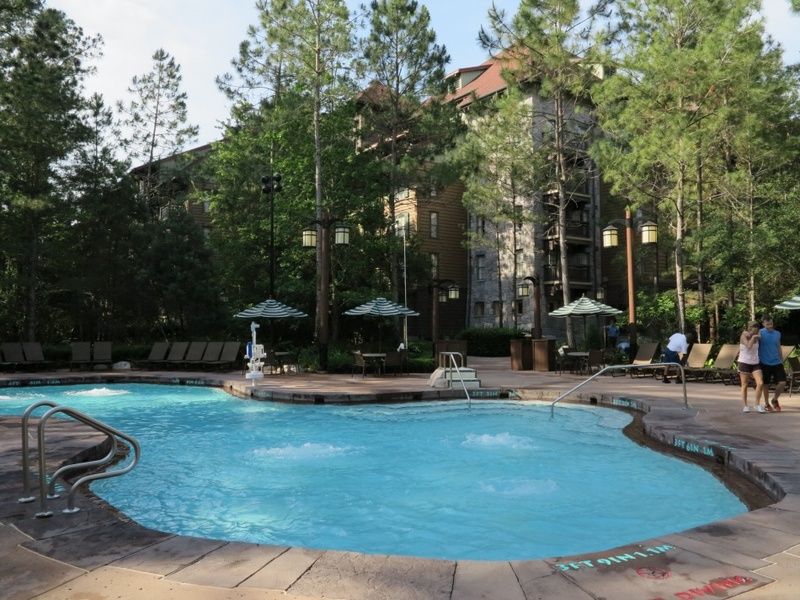 This second pool is smaller and quieter than the Silver Creek Springs pool, a perfect place to go if you’re looking for a mellower experience. It is also more shaded than the larger pool. Small geysers bubble up inside the Hidden Springs pool. 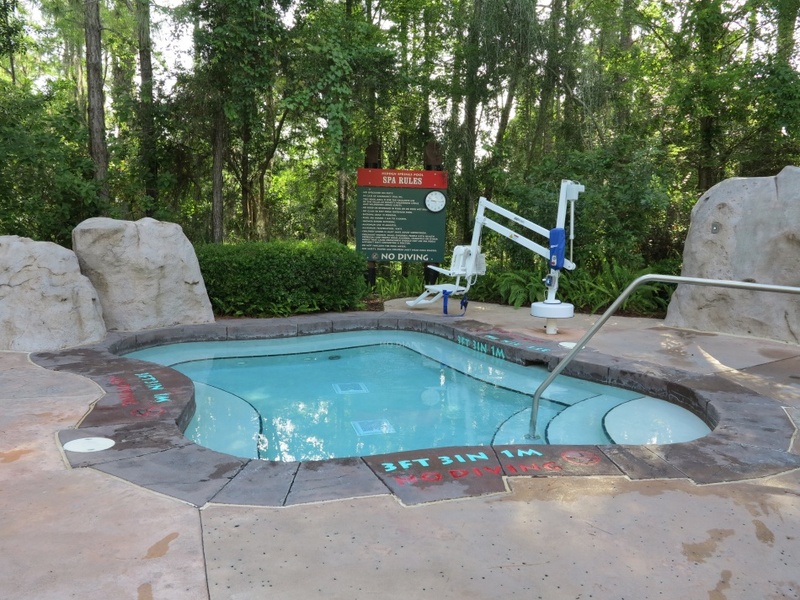 The Hidden Springs pool has a spa as well. If you would like a little sand between your toes, check out the beach on the shore of Bay Lake. There are plenty of beach loungers for sunning. Swimming is restricted to the pools but there is a roped off wading area on the beach to get your feet wet. 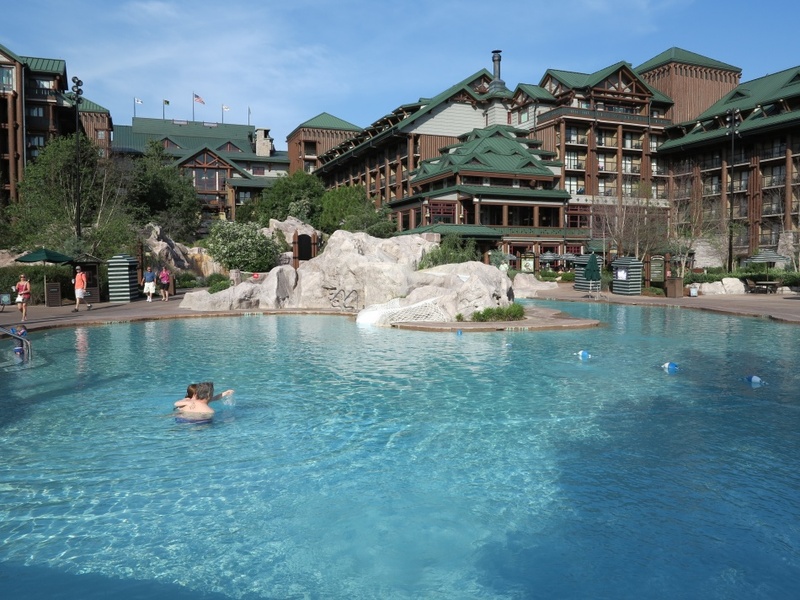 One thought on "Pools at Disney’s Wilderness Lodge and Villas"
Check out Wilderness Lodge pools and spas!